Rapid double clicking on an object when the Select Tool is active will select an object and change the tool to a tool appropriate for editing that object. For example, double clicking on a rectangle will select the rectangle and change the tool to the Rectangle Tool. 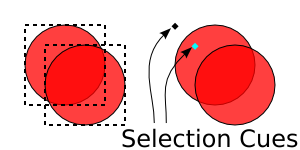 If an object cannot be selected, it may be locked. Objects can be locked against modification in the Object Properties dialog (Object → Object Properties... (Shift+Ctrl+O)). Unlocking individual objects requires use of the XML Editor (look for the locked object and then either delete the “sodipidi:insensitive” attribute or uncheck the Lock box in the Object Properties dialog; see Chapter 17, XML Editor). One can unlock all objects with the command Object → Unlock All. 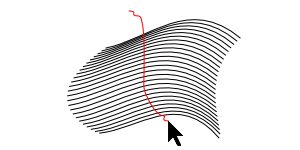 Objects may also be in a locked Layer (see the section called “Layers”). It is possible to “hide” an object by checking the Hide box in the Object Properties dialog.This raises the question: How do you select a hidden object? There are several ways. One is to use the Find dialog (Edit → Find... (Ctrl+F)); search for the Style display:none with the Include hidden box checked. A second way is to look for it with the XML Editor (see Chapter 17, XML Editor). 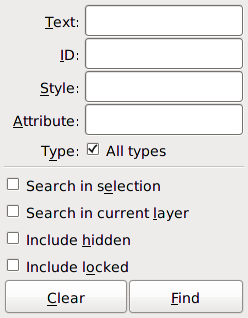 A third way is to enable the selection of hidden objects using the Tab key in the Inkscape Preferences dialog's Selecting tab. A fourth way is to unhide all hidden objects using the Object → Unhide All command. While these are solutions, the ultimate solution is just to not hide objects. Instead put them on a separate Layer and hide the Layer (see the section called “Layers”). Shift+Ctrl+A: Select All in All Layers: Selects all objects in all visible and unlocked Layers. The Find dialog has two parts. The top part defines what is searched for while the bottom part defines where to search.